I bought this blanket cardigan at the now defunct, Piperlime, and the crazy fuzzy bag is my favorite flea market find, but I added a few links to similar items. You can get this extact Aztec pendant at Yosa, an online site run by the super fabulous Rachel The Hat! I think my cute lil photo bomber was a jealous of my fuzzy bag! A few of my favorite looks from last week …. Doesn’t Shellie of The Fabulous Journey look ultra chic in this leopard dress? Jessica of Elegantly Dressed and Stylish is also rocking some fabulous leopard and on point over the knee boots. Debbie of Fashion Fairy Dust looks like a stylish angel! This is one of my favorite looks on Debbie … gorgeous! Anybody else have a three day weekend coming up? Enjoy the link up, Ladies! I'm with cutie patootie puppy..jealous of that fab bag!!!! I love you in a wrap and it's Aztec at it's best!!!! You look fanflippin-tastic!!!! 😉 Hugs!! Great cardigan! And I LOVE LOVE LOVE the necklace! Love you cozy cardigan blanket!! Thank you for hosting and hope you are having a fab week! I don't wear a lot of Aztec designs but when I see them I instantly wish I did. And if you're going to embrace the design, why not double it up, right? Love this look, you adorable lady! Love aztec prints on anything and your poncho is no exception! 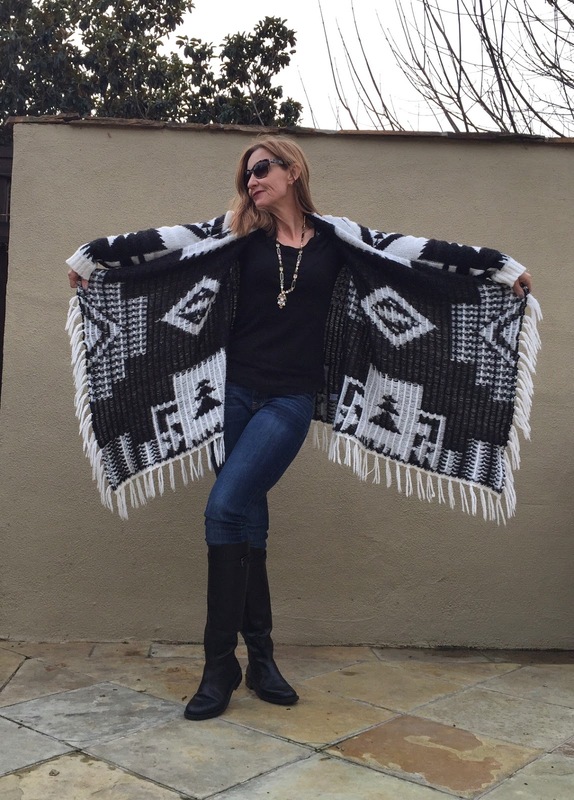 The aztec blanket cardi is beautiful on you and your accessories are so on point. That cardigan is fabulous! I love that necklace! So beautiful and I love the dog with your pup in it 🙂 That necklace goes great with the sweater! Love the sweater and necklace. Like florals, aztec prints transcend age and can look good on everyone. Gorgeous poncho and necklace. I am jealous of your long legs, girlfriend! Aww you're too sweet! 🙂 Thanks J! I love the aztec print. Looks so warm and conformable. I've been looking for something similar but it is the middle of summer so probably not going to find what I am looking for right now. Fabulous cardigan, and such a cute photobomber! The necklace really matches the cardi perfectly. Enjoy your long weekend! Love the blanket cardigan! I miss Piperlime. Hi Dawn, love the print on you and the coziness factor this outfit envokes. You look marvelous! Great choices you've shown. You pup must of thought, hmmm that's an awfully square dog?love the clutch! Dawn…that is a standout cardi! The graphic print and the fact it's like a cuddly blanket you can wear in public makes it a win. That bag though…how cool is that?! I am so loving that cardi and bag!! Cute outfit! I love it! Thx for hosting! Your look amazing with the blanket coat! Love it! If you're gonna double, double with a healthy dollop, just as you've done here. I've long admired Rachel's necklace and it looks fab with the Aztec cardigan. Double the Aztec fun! The black and white poncho is fabulous and I'm in love with the necklace! And your poochie photo bomber…the best! Beautiful! You look great in this black and white aztec print! Looks like such a cozy cardigan. Oh my gosh Dawn Lucy! That necklace is amazing!! So, not many people nowadays know this about me, but when I graduated from college with a degree in English it was expected that I'd become a teacher. I was like, No way! What I did want to do though was give back in some capacity, so I signed up for various different volunteer organizations. Mainly I just I wanted to share with you that I really resonate with this look because the Jicarilla Apache Indians, the Hopi, Navajo, and Taos too, have a special place in my heart! 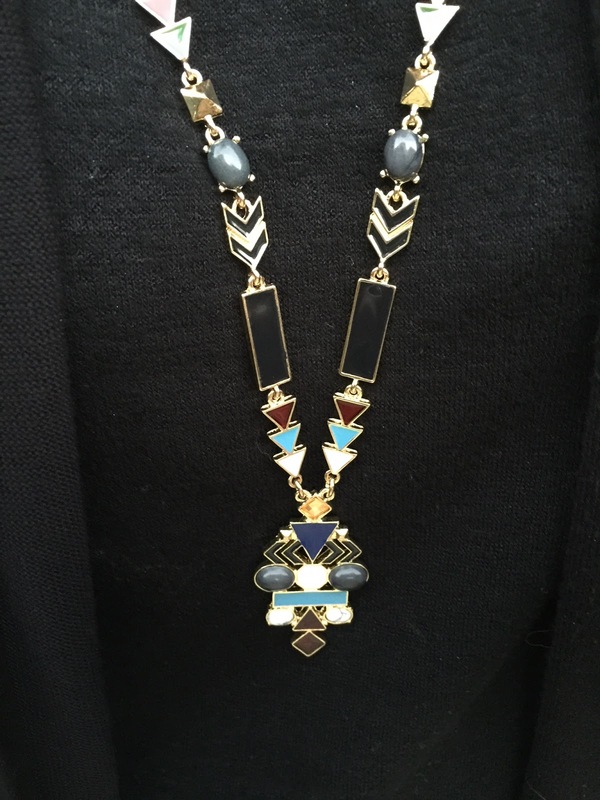 Long story, but you prompted it with your gorgeous poncho and stunning necklace. Thanks for linking up to the Kremb de la Kremb Style Stories Link Up. See?! So many stories from me. Hahaha! Beautiful! Love that blanket cardigan!